This is from a talented blogger David Hayward, who describes himself as an "artist trapped inside a pastor's body". I frequent his blog often and he has ministered to me in the past year since I was ejected from a church though his humor and artistic gifts. 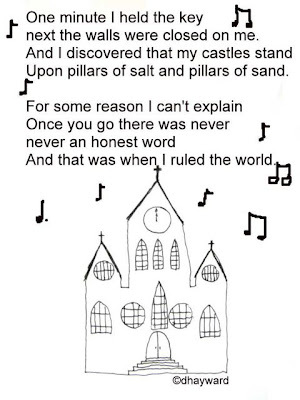 This is not a holistic approach to Coldplay's "Viva La Vida" song, but it does make one pause and think. I think this can be applied to many things going on in the world today (hence why they wrote it), but this was a thought-provoking application. This goes well with Nick and Josh's Podcast with Peter Rollins. I highly suggest listening (to all of them), but I esp. like this one! i don't get it. but then i don't know anything coldplay sings, either. so shoot me. but thanks for pointing me to the nick and josh site - looks like some good commute listening.